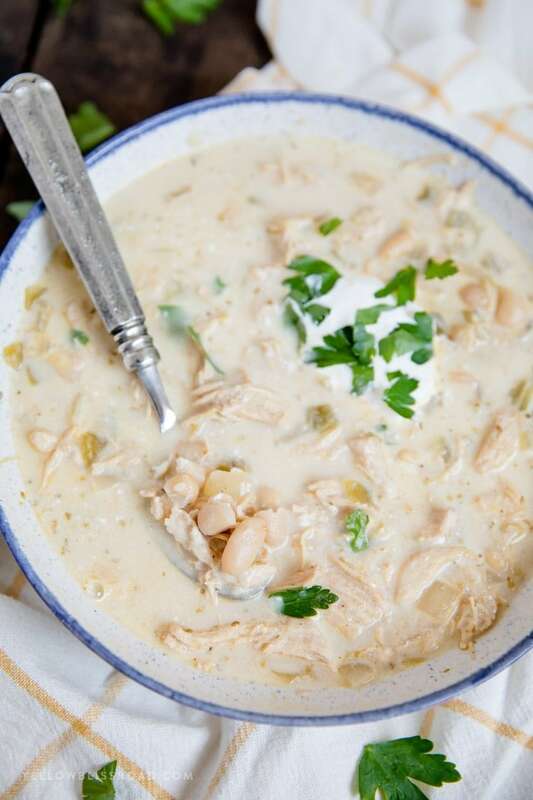 Hearty, warm and comforting, this White Chicken Chili recipe is the perfect cold weather meal. 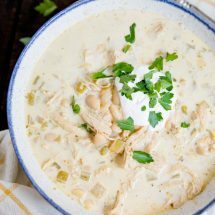 Full of delicious tender chicken, white beans, spices and cheese, this creamy soup has quickly become a family favorite. Soup weather is my favorite kind of weather. My family would agree, as soups are pretty much our go to during the winter months. Granted, winter in Southern California isn’t “freezing” but it’s cold enough for us to break out the soup pot and that’s all that matters! Oh who am I kidding, because we will break out the soup pot any time of the year! We are huge fans of chili, and have several different chili recipes that we enjoy on a regular basis, like Slow Cooker Pulled Pork Chili, Easy 3-Ingredient Chili Recipe. 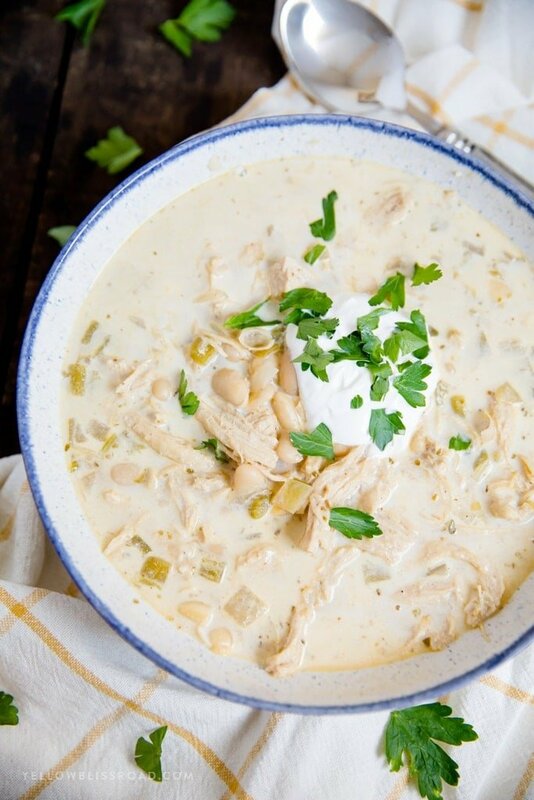 However, we’d never tried a white chicken chili recipe until recently, and boy have we been missing out! The flavors are so amazing, similar to my Green Chile Chicken Enchiladas (another family favorite) with just a little heat and some Mexican spices like oregano and garlic. 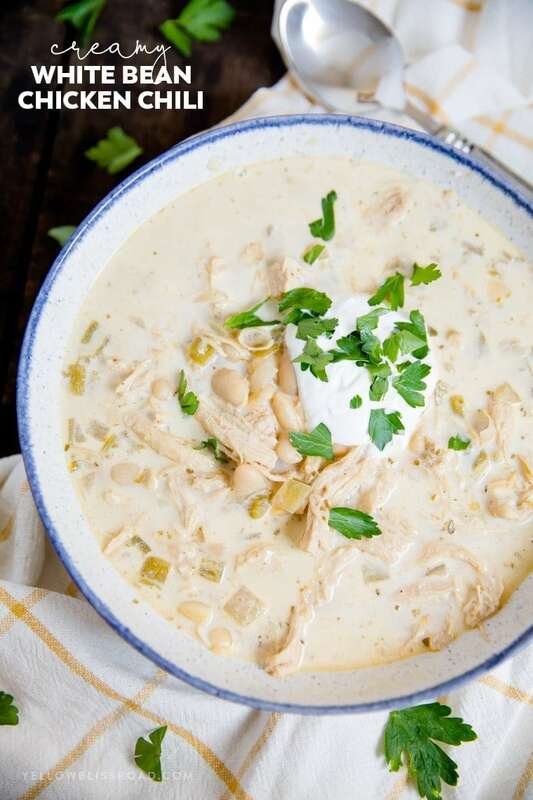 This White Chicken Chili Recipe is another easy recipe that you’ll want to add to your regular dinner rotation. It’s crazy simple to make, especially if you opt for an already cooked rotisserie chicken. The other option is to boil the chicken in chicken stock (the same stock you’ll be using for the chili). 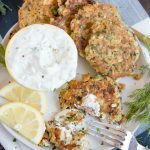 Super easy and only adds about 20 minutes to your cooking time. You could also toss in some pre-cooked chicken if you happen to keep that on hand. Start by preparing the chicken. If I’m cooking the chicken in the stock, I actually start by sauteing the onion and garlic, then adding the chicken and stock. 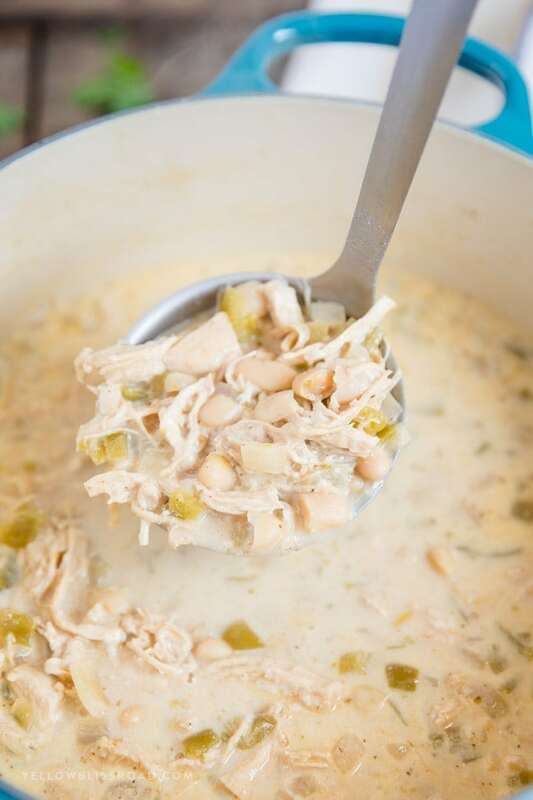 This gives the chicken an incredible flavor that blends so well with the other ingredients in this white bean chicken chili. If you’re starting with pre-cooked chicken, just saute the onion and garlic until soft, then add the other ingredients. 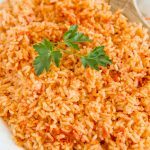 PRO TIP: To always have shredded chicken on hand for this and other recipes, try making a big batch of Instant Pot Shredded Chicken. Once the chicken is cooked, shred it on a cutting board, then add it back to the stock in the soup pot along with the green chiles, white beans and spices. Bring it to a boil and let it simmer for a good 15-20 minutes or so, to give the flavors a chance to blend together. I will actually do this with the lid off so the stock reduces and thickens just a bit. Finally I add sour cream and Mozzarella cheese to the soup. Why Mozzarella? Well to be honest, because it’s what I had at the time! But I actually really like this mild, melty cheese and it gave a perfect smokiness with being over-powering. Just like with regular beef chili, be sure to have lots of toppings on hand, like sour cream, corn chips, cheese, diced onions or cilantro. This soup can easily be made in a slow cooker! 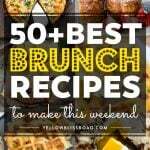 Add all of the ingredients except the cheese and sour cream to the crock pot. Cook on high for 4-5 hours if using raw chicken breasts, and about 2 hours if using pre-cooked. 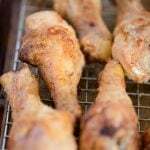 If cooking raw chicken, you will need to shred it once it’s cooked and add it back to the pot, letting it cook for another 30 minutes or so. Add the cheese and sour cream just before serving. I do recommend sauteeing the onions and garlic before adding them to the slow cooker, but it will be ok if you don’t. Can you freeze white chicken chili? Absolutely! 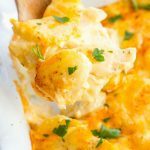 Add all of the ingredients, except the cheese and sour cream, to a large freezer bag and freeze for up to 6 month months. To serve, thaw in the fridge overnight, then bring to a boil on the stove and let simmer for 20 minutes. Add the cheese and sour cream just before serving. Large Cast Iron Soup Pot/Dutch Oven: My favorite brand of cookware – this is the best I’ve ever used. It cooks evenly, heats up fast and cleans up like a dream. 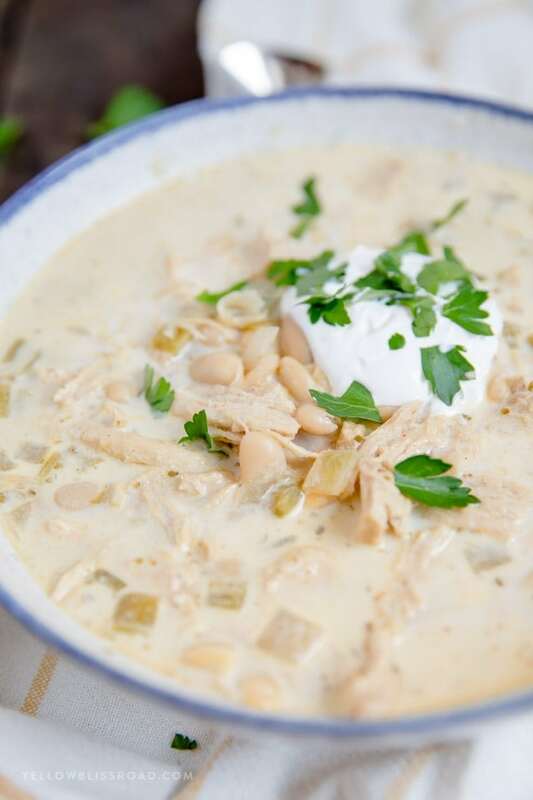 Hearty, warm and comforting, this Creamy White Chicken Chili recipe is a perfect cold weather meal that's full of chicken, beans, chiles, spices and cheese. In a large soup pot, sauté onion in a tablespoon of olive oil over medium heat. Add garlic and stir for 1 minute. Add chicken stock and bring to a boil. Add chicken and simmer until chicken is cooked through and tender; about 15-20 minutes. 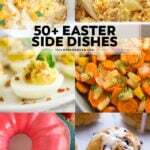 *Alternatively you could use any leftover or rotisserie chicken - you need about 4 cups. 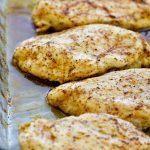 Remove chicken from the pot and onto a cutting board. Shred with two forks. Skim any fat or foam from the chicken stock and return chicken to the pot. Stir in green chiles, oregano, chili powder, cumin and white beans. Bring to a boil. Reduce heat to low, cover and simmer for 20 minutes. Stir in cheese or reserve for garnishing each bowl. Serve hot, topped with desired garnishes. And be sure to pin this recipe to your SOUPS board! Do you blend the 1.5 c of cheese into the pot of soup at the end of simmering or just top with the mozz? Same question for the sour cream (and how much?). I’ve updated the recipe to make it more clear, sorry about that. I add about 1/2 a cup of sour cream and cheese to the pot at the end. I also make sure to have some extras of both for topping the individual bowls. Thank you for the clarification. I made it tonight and it is good. However, I missed the corn. 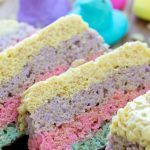 It is not in the ingredients list and I didn’t notice it in the recipe until I was making it and I had none on hand. How much corn do you normally put in? I am so sorry, that was my original recipe, but I tweaked it a bit when I posted and don’t use the corn. I’m glad you enjoyed it though! Hi Kristin, When I click on your Dorito Taco Salad Cassarol,the recipe for your White Chicken Chilli recipe comes up. It’s delicious but I would like to have the Dorito cassavole too.